Bio Pac is Biodegradable and Formulated for the Chemically Sensitive! 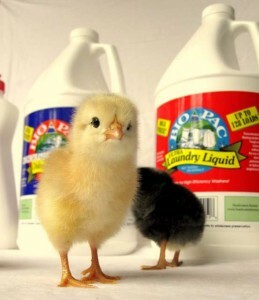 Bio Pac offers a line of biodegradable cleaning products sold in refillable containers and recycled bottles. We list every ingredient used in our products. Our products contain no animal ingredients and are never tested on animals. Bio Pac, Inc. donates a percentage of profits to conserving wilderness. Our products are sold in natural food stores throughout the country. Our super-concentrated line of biodegradable laundry products powerfully yet gently clean your clothes without leaving a harmful chemical residue behind. Our Bio Pac Laundry products are biodegradable, concentrated, safe for HE washing machines, and formulated for the chemically sensitive. Bio Pac offers several household cleaning products that will help keep kitchens, bathrooms, and other surfaces clean and healthy. Our biodegradable formulations are formulated for the chemically sensitive (i.e. pets and kids). Skin is the largest external organ we have, and Bio Pac offers a line of gentle soaps that effectively clean and moisturize it without harmful chemicals. Are You Looking for our Oasis Biocompatible Cleaners?